We’re going through an exciting time here on the blog. We’ve got just a few days to go on our fundraising drive. 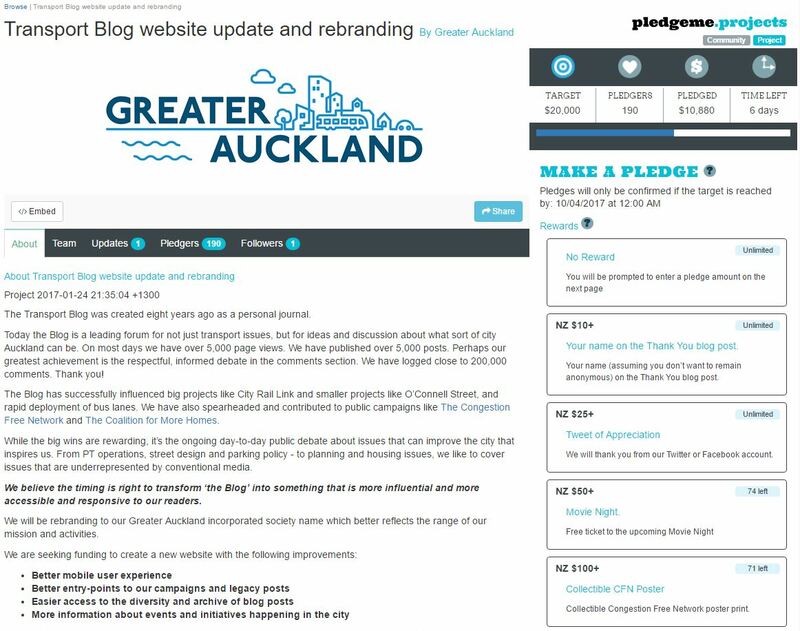 Last week we launched our new website and formally changed our name to Greater Auckland. We also revealed that one of the initiatives we want to kick off with the funding is to pay for regular professional, independent surveys of the Auckland population. We would like to understand what Aucklanders actually want in transport, rather than what groups with vested interests want. This post is to give an update on a few of these points and to give a tease of our big new campaign launching next week. The featured post boxes will act more like buttons (currently you have to click the text). We’ve been humbled by the support we’ve had so far and thank you to everyone who has pledged already. At the time of writing this post we’ve had 190 pledges for a total of just under $11,000. Remember, in crowdfunding we must meet the target of $20,000 to make any money. With only 5 days left, if you are a reader who enjoys the content, advocacy, and forum here, please take the time to contribute today. If if we haven’t persuaded you to already, perhaps our big new campaign will. We’re currently putting the finishing touches on the second iteration of our Congestion Free Network (CFN) and we intend to launch this formally on Monday morning. Here is an excerpt from our summary document that we’ll be releasing along with the map we’ve developed. We have also learned a lot more about how Auckland will grow in the future, as decisions have been made on the Unitary Plan, and about what Auckland’s growth means for our transport network. Put bluntly, unless we invest heavily in serving new “greenfield” growth areas with congestion free transport options we will repeat the expensive, disastrous, mistakes that litter our history. Similarly, as existing urban areas intensify we will need to shift more people in the same amount of space – a task that is simply impossible by car. Aucklanders have flocked to buses, trains and ferries over the past four years, especially where major improvements have been made. Annual ridership on the rail network and the Northern Busway – our still embryonic CFN – has grown from 12.3 million to 22.9 million over these past four years. With such momentous change, it’s time to re-look at the Congestion Free Network and to align it with present day conditions. With ATAP showing government’s agreement, Auckland needs a strategic public transport network – what we call a “Congestion Free Network”, the debate now is not if we should build it, but when. And as a teaser, the core of the map. You may have noticed that one of the options on our fundraiser was a collectible CFN poster. The full version of this is what people who choose that option will get. It will be A2 size and on high quality print on proper poster stock and includes shipping – depending on the location, we may even deliver some personally. If you hadn’t guessed by now, it’s been a very busy few months behind the scenes. 1. Suggested website tweak is any links in the posts should open automatically in a new window/tab if viewing on PC and esp.if links are not from your own site. This is pretty standard now isn’t it otherwise you can lead people away from your website & they may not return? It’s handy to click on them all and read the details of those after reading the main post, or refer to them as you go if you want to. 2. I often let my iPhone read the posts then comments with the “Speak Screen” feature in iOS, you can have your device read whatever is on the screen to you just by swiping two fingers down from the top of the page after setting the feature on in Accessibility settings. This is good if you want to catchup on posts/comments or when multi-tasking or want to give your eyes a rest! The new website seemed better at this than the old (reading less fluff at the start and end), except formatting must of just changed in that you can’t start half way down the comments like I did a few days ago (it starts from the top of the post again! – it’s good to get new comments read in order after refreshing the page). Ideally you would have reader mode enabled to work on the comments section not just the post as it is currently as then it reads less unnecessary guff. Onced subscribed to a post I normally just read the emails that come in. Opening links in a new window or not is a decision you normally leave to visitors. Browsers allow you to choose (eg. desktop browsers usually open in a new tab if you use Ctrl+click). Maybe, not so sure for external links. I’m probably lately used to gmail webmail where clicking on any content opens in new tab for me, so I half expect it to happen without doing a Ctrl+click. I agree with roeland. It is MY choice to open things in a new window or not. By forcing new windows on me you are breaking the whole back/forward functionality of the internet which has been around since day 1. – the contrast between the grey text on the grey background in the comment section is quite low. – on the desktop, nested comments have a large indent on both sides. Deeply nested comments end up only a few words wide. – the large font size and high line spacing mean only a very small amount of text fits on a phone screen, especially inside markup like lists and quotes. I think the CFN 2.0 idea is a very good one. Rallying for the CRL and then the CFN gave this site it’s originl purpose; adding to the debate and changing the common perception away from a story entirely controlled by the NZTA and their pals the AA and Road Transport Forum. Just saying those 3 names together already feels so outdated. Keep up the good work! $700 to go in 3 days – come on everybody! On the website front, adding number/link to comments in the coloured boxes would be handy for people like me that read the articles first thing then later return for the comments.